I bought 4 of Anchee Min's books back in February and have read all of them except this one, until today. Whilst I found those 3 books just okay and even though this one is over 300 pages long, it has so captivated me that I could not put it down. Not being American and though I'm Chinese by ethnicity, I have never been back to China and my historical knowledge of China is sparse, I have not known about Pearl S. Buck till now. I am now looking forward to reading her books, especially The Good Earth. Some have said that they would rather the book been written from Pearl's vantage point, rather than from a friend's, in this case, a fictionalised version of a friend, Willow Yee. I would disagree and felt that Min did a great job in telling the story from a Chinese perspective. 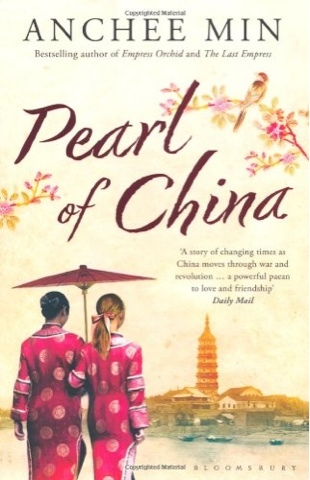 It speaks of a girl who got to know a very special friend in Pearl and how their relationship grew and grew; and when Pearl had to leave China, the tone of the book averted to one of pining and longing. I must say, I have not cried so much reading a book, it is embarrassing! What was unexpected was the Christian "flavour" of the book. Even though the message of the gospel of Jesus was not at all apparent and there were several parts where I winced at the dialogue when they talked about the faith, particularly on a work-based salvation rather than grace (though the hymn that holds center point in this book is John Newton's Amazing Grace)--not sure if it was intended by the author or if it was her misconception--I found it quite refreshing to read how Christianity took root in China. And it felt so encouraging to read about how the characters held on to God in their acute suffering and persecution. But of course, this is a work of fiction, albeit historical, things might not have happened as depicted. I have really enjoyed reading it, an excellent read indeed.